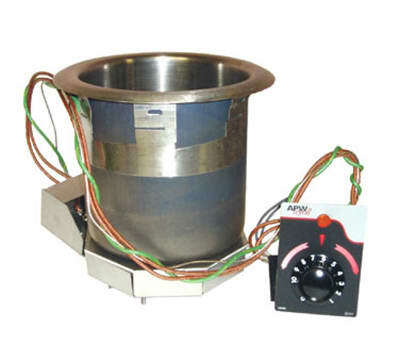 This APW Wyott heavy-duty top mount, uninsulated round drop-in hot food well is designed for installation in metal or wood countertops. This round drop in hot food well is constructed of one-piece die stamped 20 gauge type 304 stainless steel for the best in durability and easy cleaning. Heated by a tubular calrod heat element that is shaped in a circular fashion, this 11 qt round hot food well provides even heat distribution. The entire heat assembly is covered with an aluminized steel housing with thread studs for easy service. This 11 qt round drop in hot food well can be used for wet or dry foods for versatility. Keep your hot foods hot at all times when you invest in a handy 11 qt hot food well from APW Wyott! APW Wyott backs this fabulous drop in hot food well with a 1 year parts and labor service warranty!